I have one project that was published a few years ago and again recently reprinted. This project had miles of oak cabinetry. The homeowner didn't want to paint them or change them all out for various reasons. They liked a refined rustic/craftsman style look and love natural materials. 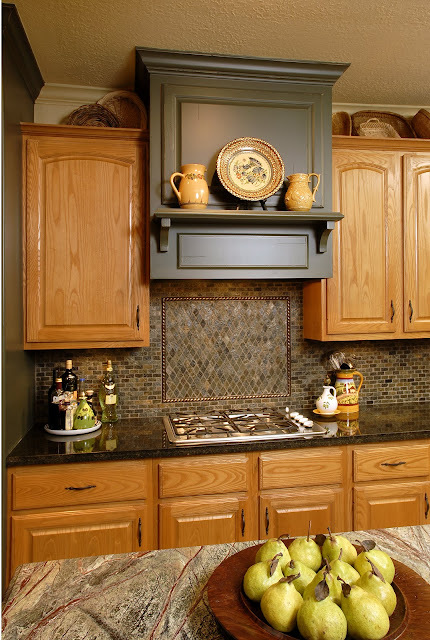 The challenge became how to make those builder standard oak cabinets look good. Items that had to go: oak floors (too much oak, they wanted something more durable, and it didn't match the other oak flooring in the adjacent dining room), off-white counters, busy, dated wallpaper, dated light box, backsplash, white refrigerator, oddly shaped island. By pairing the oak with a dark color, the green in this instance, it became a two tone kitchen. We created contrast and the green was a rich accent to the oak. Notice all the elements we added, countertops, backsplash, and new cabinetry were that dark green color. The light color in the space became the oak or oak color. The dark color is the green. When you tie several different elements in a space together with color and value, you make a stronger statement. The slate floor mixed those two colors together beautifully. That slate is call Imperial Sunset from Thorntree here in Houston. I'm not a fan of making do with outdated materials and old features unless it can be done well and there are valid reasons for keeping them when you remodel. I do think however that this project has a timelessness about it, that the new and old blend really well, and I have to say....those oak cabinets never looked so good! Thank you Better Homes and Gardens, for publishing this project again. It definitely hit home with a lot of people. I've moved! I would love it if you would follow my new blog, Designed w/Carla Aston! If you have a design related question or need some advice on any aspect of interior design, e-mail me HERE. I might feature your question in a special Q and A blog post! what a difference the green cabinets and the slate floor make in setting off the oak...so well done.. and the back splash is perfect for a clean updated look..
You are so talented! The kitchen is just stunning. Saving this. This is a beautiful solution for those who can't afford to completely remodel. Personally, I still like stained cabinets, not oak so much, but I think there's a warmth and family-friendly quality to kitchens with stained cabinetry. Fantastic! I am sure your client appreciated the fact you could design within her budget. It came out great.You are very talented. I just wish I could find some more! My parents have builder-grade oak cabinetry, and I have begged, BEGGED my mother to paint it. She won't hear of it. I wish she'd at least update it somehow with hardware - something! Funny how a little thing like cabinets can get under a design-junkie's skin! Do think what you did was very becoming of the kitchen. I know no matter what our aesthetics are as designers/decorators, we still have to honor the client's. show her anything else you think she might like. if she doesn't get the bathroom published, there might be some other job of yours that she might be able to get published!!! good luck! i hope she gets that bathroom in a magazine!!! I like how you listen to your client's request yet updated it and make it really beautiful through incorporating new backsplash, slate floors, accessories, etc. Everything looks so fantastic now! You are seriously talented, Carla! By the way, I am hosting a giveaway! Come by and enter to win a stylish book- Shoestring Chic by Kerrie Hess! Carla, this is totally outstanding and what an inspiration! I have oak and hate it, and have been thinking of a colored stain instead of paint. I'm going to play around with a look like this. You are so sincerely talented. You always amaze me, really. No wonder it was published twice. Wow! what an improvement...and ties in with the stone flooring. I think it was a great decision to make a two-tone kitchen. Oak is lovely and oak flooring was nice, too. But I also had the feeling I am seeing too much oak in the photos of the prev. kitchen. The new ceramic tiles, kitchen work-top and new green cabinets turned this kitchen to be exciting instead of boring. Congratulations! Can you please tell me the colors and brands of the counter tops, and the backsplash ceramic tile? I love it so much! 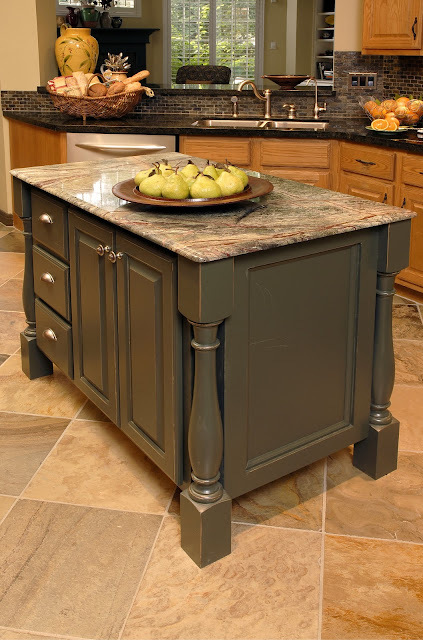 I am also curious about the paint color you used on the walls as well as the color on the island? I love this look-it is what I have been looking for-I have 20 year old oak cabinets, but can't afford to buy new ones. 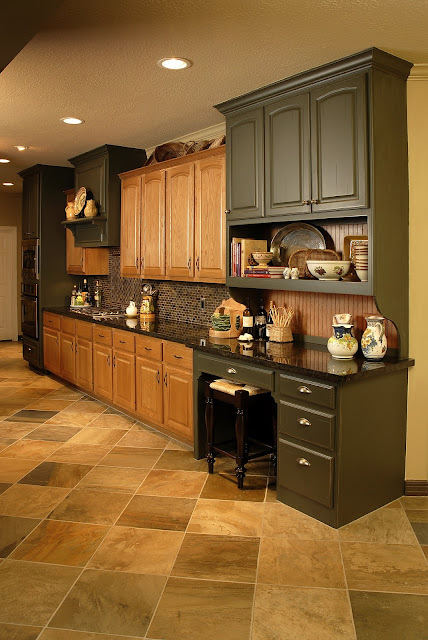 I love the idea of painting some of the cabinetry, too. Would love to use a black matte paint. 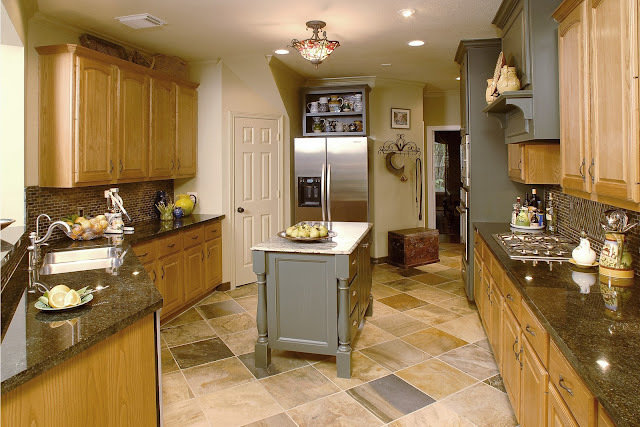 What a stunning kitchen and a huge improvement! I had to keep scrolling back and forth to compare! Visiting from WUW. Your kitchen is gorgeous...it's no wonder that it landed in the pages of the magazine...Beautiful transformation. Beautiful! Great ideas for my new kitchen some day! I agree. You blended the old and the new masterfully. It's a gorgeous kitchen. Could I please get the color of paint you used on the island. Thanks so much!! What is the name of the backsplash? This is just beautiful!! Yeah, Great job before and after. I like rustic materials, it gives special nuance in the room.